We’d love your help. Let us know what’s wrong with this preview of Doubt by Jennifer Michael Hecht. To ask other readers questions about Doubt, please sign up. Hecht's historical survey of doubt is a lot of things and seems to do them all very well. It is a defense of doubt, a survey of doubt, a biography of doubters, a family tree of doubt's relatives. It looks at doubt both from within and external to belief. It examines the motives and believers and gives each its appropriate doubting due. I found the book to be highly readable. Strange to say, it was almost TOO readable. I felt myself slipping through the pages almost too fast. It has given me a whole new group of thinkers and philosophers to examine. I was very familiar with many of the doubters in Western and Classical traditions, but Hecht gave me a whole new group of Eastern, Jewish and Muslim doubters to get to know. Plus, even with those nonbelievers & skeptics I was familiar with (Lucretius, Montaigne, Spinoza, Cicero, Epicurus, Pliny, Gibbon, Paine, Jefferson, Bruno, etc.) she gave me whole new approaches and windows to see them through. What is it they say? "History is written by the winners." That is unless you're Howard Zinn ("People's History of the United States") or Jennifer Michael Hecht, writing "Doubt: A History." No, I'm not calling these two "losers," but they definitely adopted Quixotic missions in championing the unspoken viewpoint of "the other side" of history. And both turned out encyclopedic tomes on their respective topics. But as much as I enjoyed Zinn's take on American History (recommended, by the way, by Mat What is it they say? "History is written by the winners." And both turned out encyclopedic tomes on their respective topics. But as much as I enjoyed Zinn's take on American History (recommended, by the way, by Matt Damon's off-hand line in "Good Will Hunting" -- How do you like THEM apples? ), Hecht is superior in my view in delivering the more meaningful and important record of a branch of thought that is not only often ignored, but ostracized, pilloried, martyred and pogrommed. The tale of humanity's ability to question is what is at stake here. This is the tale of all those through history who have said, "Now, wait a second... Could it be that your interpretation is incorrect?" It is the tale of all those inchoate scientists (even before the term) who looked at the empirical world and said, "Man, this does NOT jive with what the priests are telling us." So, on topic alone, I cannot recommend this book highly enough. How about content, style, execution? Hecht is deft and witty, though over the course of 700+ pages she clearly has her favorite doubters, and they receive better writing and attention. The last chapter seemed a bit rushed, but then it is always hard to write history about the present... so little time for perspective to mature on what is happening. This is a good introduction to a pantheon of philosophers through the ages. If you don't add at least 5 names to your list of "People whose writing I must read," then you are either a professor of philosophy already, or not reading very closely. An absorbing history of healthy skepticism through the ages. Personally, I've always joked that Descartes' "I think, therefore I am" could be "I doubt, therefore I may not be." In reading this book, I realize "I think, therefore something thinks, but it's not necessarily me." Which can ironically lead one to a non-dogmatic spirituality. As an agnostic, I find the claimed certainties of both religion and science to be irksome. As Hecht has in her book (it may be a quote from someone else), the rea An absorbing history of healthy skepticism through the ages. This book traces the history of religious doubters, skeptics, and atheists from the classical world through the middle ages to the modern era. It seems that every age has had religion and every age has had its disbelievers. The disbelievers of history form a who's who of famous minds. Ancients like Lucretius and Democritus, to the middle ages with the great Arab scholars like poet and physician Omar Khayyam, to the modern era where the list explodes. Jefferson, Madison, Franklin, Paine, Voltaire This book traces the history of religious doubters, skeptics, and atheists from the classical world through the middle ages to the modern era. It seems that every age has had religion and every age has had its disbelievers. The disbelievers of history form a who's who of famous minds. Ancients like Lucretius and Democritus, to the middle ages with the great Arab scholars like poet and physician Omar Khayyam, to the modern era where the list explodes. Jefferson, Madison, Franklin, Paine, Voltaire, Russell, Sartre, Hume to name some of the heavy hitters. This book is one of my favorite histories of a venerable tradition that doubted what everyone else believed. I have nearly reached the end and I know I will be starting again when I finish. I enjoy Jennifer's writing style very much. It feels to me like we're two friends walking though a museum and she's giving me the guided tour of my life. She speaks to me in a conversational tone opening up my mind to the secret history of thought. I'm relishing in the choice bits she chooses to quote, like handpicked produce from the grower. She hasn't grabbed the bag of discount apples from a supermarket like so m I have nearly reached the end and I know I will be starting again when I finish. I enjoy Jennifer's writing style very much. It feels to me like we're two friends walking though a museum and she's giving me the guided tour of my life. She speaks to me in a conversational tone opening up my mind to the secret history of thought. I'm relishing in the choice bits she chooses to quote, like handpicked produce from the grower. She hasn't grabbed the bag of discount apples from a supermarket like so many authors do. I think I've grown up a bit and feel the discussion of ideas and their context is much more interesting than a debate on who is right. I will be hunting down and devouring more of her books. As far as her "Scale of Doubt" quiz in the introduction, I must be a true agnostic. I answered "I don't know" to all the questions but two. This is a hefty, dense tome. There's a lot of quality analysis, history and argument here, but the problem with a book like this is that it's a 'preaching to the choir' sort of exercise. People who are already somewhat doubtful of established cultural institutions will be nodding in agreement and amusement all the way through, and will likely already be familiar with much of the historical and philosophical background the book provides, but those who have a more reverent attitude toward those in This is a hefty, dense tome. There's a lot of quality analysis, history and argument here, but the problem with a book like this is that it's a 'preaching to the choir' sort of exercise. People who are already somewhat doubtful of established cultural institutions will be nodding in agreement and amusement all the way through, and will likely already be familiar with much of the historical and philosophical background the book provides, but those who have a more reverent attitude toward those institutions will not be swayed by anything here. A masterful work, both in scope and execution. Jennifer Michael Hecht traces the development of doubt, both within religion and without religion, from the ancient Greeks and Indian Charvaka (an ancient materialistic, non-theistic response to Hinduism I'd never even heard of) to Paine, Jefferson and the current crop of modern skeptics and atheists. Along the way, she demonstrates the importance of doubt in challenging assumptions, sparking reflection, and driving thought forward. Hecht is a poet A masterful work, both in scope and execution. Jennifer Michael Hecht traces the development of doubt, both within religion and without religion, from the ancient Greeks and Indian Charvaka (an ancient materialistic, non-theistic response to Hinduism I'd never even heard of) to Paine, Jefferson and the current crop of modern skeptics and atheists. Along the way, she demonstrates the importance of doubt in challenging assumptions, sparking reflection, and driving thought forward. Hecht is a poet and philosopher, and crafts a beautifully written look at the progression of questioning throughout time and across geography. With each prominent figure and movement, we learn which previous thinkers influenced the discussion, which ideas were challenged, and how the world was changed as a result. Doubt is widely defined, and even religious figures play important roles. It's as ambitious as you'd imagine, detailing figures as diverse as Democritus, Epicurus, Job, Koheleth, the Buddha, Confucius, Wang Ch'ung, Cicero, Pliny the Elder, Lucretius, Marcus Aurelius, Sextus Empiricus, Jesus, Paul, Augustine, Hypatia, Ibn al-Rawandi, Abu Bakr al-Razi, Maimonides, Pomponazzi, Montaigne, Rabelais, Voltaire, Giordano Bruno, Descartes, Baruch Spinoza, Pierre Bayle, Thomas Hobbes, Edward Gibbon, Benjamin Franklin, Thomas Paine, Thomas Jefferson, Charles Darwin, Karl Marx, Sigmund Freud, Harriet Martineau, Susan B. Anthony, Elixabeth Cady Stanton, Emily Dickinson, Wittgenstein, Kierkegaard, Mark Twain, and Bertrand Russell. When one has certainty, there is no more room for further knowledge or understanding. Science and Reason never prove, at the most they can just show things to be less false than other things. There is a long history of people who haven't been certain and their story makes for a much more interesting revealing of human history than the ones who pretend to have no doubt. There are two recurring characters in this marvelous book about doubters throughout history, the Stoic, Cicero and his "On the Na When one has certainty, there is no more room for further knowledge or understanding. Science and Reason never prove, at the most they can just show things to be less false than other things. There is a long history of people who haven't been certain and their story makes for a much more interesting revealing of human history than the ones who pretend to have no doubt. There are two recurring characters in this marvelous book about doubters throughout history, the Stoic, Cicero and his "On the Nature of the Gods", and the Epicurean, Lucretius, and his "On the Nature of Things". Both get major play in this book, firstly when they are introduced and secondly they keep popping up through the rest of the story because their influence with latter sages has been immense. Survey of philosophy books with their chronological presentation can often be dull since they lack a narrative to tie the story together. This book gives that necessary narrative and gives the listener a thread to understand the connections while telling a good story that includes snippets of world history, religion and summaries of what great doubters thought throughout the ages. The author gives enough of the major points and sometimes long quotations from the primary sources to make the book or person under consideration come alive and make the listener feel as if he understands the person who wrote it. For example, I now realize why I enjoy the book of Ecclesiastics so much more than any of the other books in the Bible (it's mostly a Epicurean type polemic on the meaning of life). Her considered amount of time she spends quoting Marcus Aurelius is well worth it for the listener. I've never found anyone who I tend to agree more with and would strongly recommend his "Meditations" which is available at audible, but it might not be necessary to read it if you listen to this book instead. The other thing to like about this book: she does not ignore the East at all. She gives them equal weight to the West throughout the text. Eastern Religions are fully explored since there is a much richer tradition of not being certain, "the more you doubt, the more you understand" would be a typical Eastern religion answer to the refutation of the certainty found in revealed religions. I loved the quotes and book passages, I loved how Mrs Hecht integrated in her book not only atheistic and agnostic doubt (Epicurus, Cicero, Schopenhauer, ...) but also religious doubts (Job, Ecclesiastes, Buddha, Jesus, Jews, ...), I also loved her coverage of doubt in a lot of cultures (eastern world, muslim and jewish world, ...) other than the highly-talked about western philosophy. A highly recommended book for beginners in the field of philosophy. I have no words to describe the brilliance and execution here. If the title causes even the least spark of interest for you, read this book. I'm sure this will be one of the most well-loved books on my shelves for the rest of my life. Hecht's examination of how doubt has always lived alongside faith since the earliest times is a fascinating work of scholarship. She takes us from the beginnings of philosophy which grew alongside the earliest recorded organised religions, where the act of questioning and doubting was fundamental to the process of philosophy. This unfaith runs like a bright silver thread through history, although many times religion has sought to obscure the fact and expunge it from the records, or recast the pr Hecht's examination of how doubt has always lived alongside faith since the earliest times is a fascinating work of scholarship. She takes us from the beginnings of philosophy which grew alongside the earliest recorded organised religions, where the act of questioning and doubting was fundamental to the process of philosophy. This unfaith runs like a bright silver thread through history, although many times religion has sought to obscure the fact and expunge it from the records, or recast the proponents of doubt in a way that portrays them as faithful. She takes us forward from the Greeks and through Rome, taking in the Jewish tradition - both ancient and medieval - to Gnosticism and throughout the growth of Christianity, branching on the way to bring in the beliefs of Asia and how they had approaches that differed but often embraced doubt far ore strongly than the tradition in the West. She shows us how the explosion of unbelief that was the Enlightenment was built partly on this questioning, and the gradual acceptance that a lack of faith was not only correct and acceptable amongst the intellectual elite but also held no dangers for the masses. Finally, she shows how the meeting of Western Enlightenment and Eastern enlightenment in the 19th and 20th centuries brought yet more strength to those who doubt, and recaps how the great thinkers and writers who have pushed against or broken outside of the bounds of religion have built upon each other, and managed to find the kernels of wisdom in earlier thinkers time and again, despite the best efforts to obscure or marginalise those dangerous thought. This book changed my life. I literally took a month to read, highlight, take notes--Hecht is an excellent scholar, and she has done an amazing job of honoring the history of those who QUESTION. She explains that she wanted people to know that doubt has its own existence, not just in response to belief but as a quest for truths that may never be found. Albert Einstein once said, "The important thing is not to stop questioning"--and that's her central point. The subtitle of the book is revealing: This book changed my life. I literally took a month to read, highlight, take notes--Hecht is an excellent scholar, and she has done an amazing job of honoring the history of those who QUESTION. She explains that she wanted people to know that doubt has its own existence, not just in response to belief but as a quest for truths that may never be found. Albert Einstein once said, "The important thing is not to stop questioning"--and that's her central point. The subtitle of the book is revealing: "The Great Doubters and Their Legacy of Innovation from Socrates and Jesus to Thomas Jefferson and Emily Dickinson." I found it powerful that she doesn't shy away from the force of doubt even WITHIN religious structures. Her description of St. Augustine's doubt is wrenching in his utter distress. And I bought the Thomas Jefferson Bible after reading this book, since he held dear the TEACHINGS of Jesus, but removed all the supernatural elements. What Hecht gave ME is best expressed in the last paragraph of the book (I have it highlighted with 2 stars). "The only thing such doubters really need, that believers have, is a sense that people like themselves have always been around, that they are part of a grand history. For its longevity, its productivity, its pluck, its warmth, its service to friend and foe, and its sometimes ruthless commitment to demonstrative truth, I give the palm to the story of doubt." A good read, but more importantly, a really solid education; Not simply in terms of the history of doubters, but the history of, well, thought. Of philosophy. For someone who didn't quite get the education he might have liked, this book is a great tour through different ways of thinking about the world, freed from the gauze and blur of supernaturalism. What a wonderful experience reading this book. Its like looking back at the history of doubt and realizing that I belong to a culture that is rich and meaningful and deeply intertwined to the culture of belief. This quote from the book summarizes my experience reading it and helps to clarify that I am simply pondering on the shoulders of doubting giants who have come before me. “Theistic religions all have in them an amazing human ability: belief. Belief is one of the best human muscles; it can What a wonderful experience reading this book. Its like looking back at the history of doubt and realizing that I belong to a culture that is rich and meaningful and deeply intertwined to the culture of belief. This quote from the book summarizes my experience reading it and helps to clarify that I am simply pondering on the shoulders of doubting giants who have come before me. - She characterizes the work of the Cynics, Stoics, Epicureans, and Skeptics as some of the first self-help books in the West. I find this notion appealing, as it shows that supposedly pie-in-the-sky philosophy is actually deeply relevant to how we live, while simultaneously ennobling the much-maligned desire of human beings to read self-help books. I have never learned so much from ONE book. Jennifer Michael Hecht'a comprehension of history and philosophy is staggering. The "doubt" of which she speaks is the history of the doubting of God and gods in human thought and society. She goes from the ancient Greeks like Epicurus to Job to Lucretius to Thomas Jefferson to George Carlin and everyone else in between. Her wit and wisdom are evident on every page. I actually high-lighted this book as I read it. If you are a believer, read it. It will I have never learned so much from ONE book. Jennifer Michael Hecht'a comprehension of history and philosophy is staggering. The "doubt" of which she speaks is the history of the doubting of God and gods in human thought and society. She goes from the ancient Greeks like Epicurus to Job to Lucretius to Thomas Jefferson to George Carlin and everyone else in between. Her wit and wisdom are evident on every page. I actually high-lighted this book as I read it. If you are a believer, read it. It will challenge and shake you (hopefully). If you are a disbeliever, read it. You will learn that you are not alone, and that many wise men and women -- brave and honest -- have preceded you. In this book, I found my favorite Zen maxim that I say on a regular basis: "GREAT DOUBT, GREAT AWAKENING. LITTLE DOUBT: LITTLE AWAKENING. NO DOUBT: NO AWAKENING"
So far the chapter on Buddhism has given me the most to think about. Overall this book has morphed my thinking a little into... why can't pieces of doubt come together? I think doubt can shape the way we practice whatever it is we believe. 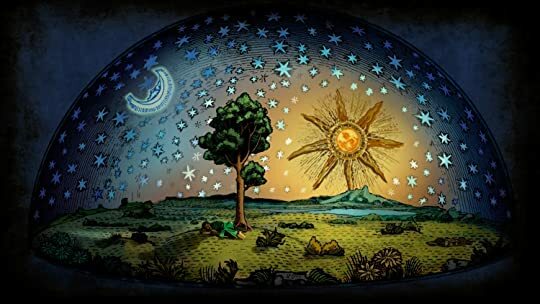 Perhaps what formed from doubt in the Greek gods led to athiesm, but the nontheistic philosophies include meditation and oneness of self and connection with nature and things we could all experience no matter what God or religion we Definitely enjoying.. a lot! This is a remarkable book and Jennifer Hecht is quite a scholar. In the canon of the History of Ideas I would rank it with The Art of Memory by Frances Yates, another wonderful scholar. Reading both of these studies was like taking a 15-week graduate course so I took my time, read slowly, and used my TASIIRR technique: Take notes; Ask questions; Skim first; Impress, associate, repeat; Introduce to others; Read aloud; Read on paper, for maximum retention. Hecht takes the approach in this survey of This is a remarkable book and Jennifer Hecht is quite a scholar. In the canon of the History of Ideas I would rank it with The Art of Memory by Frances Yates, another wonderful scholar. Reading both of these studies was like taking a 15-week graduate course so I took my time, read slowly, and used my TASIIRR technique: Take notes; Ask questions; Skim first; Impress, associate, repeat; Introduce to others; Read aloud; Read on paper, for maximum retention. Over the last 50 years or so my belief has been all over the map, from old man magician in the sky, to reverent gratitude, to almost entering the monastery, to don’t know, to don’t care, to no way. Like everyone, I’ve seen countless “proofs” for the existence of God, like the birth of a grandchild, or the beauty of the bountiful rolling green countryside, and I’ve also seen incontrovertible evidence that God could not possibly exist - like the illness of a grandchild, or grass that has to be cut Over the last 50 years or so my belief has been all over the map, from old man magician in the sky, to reverent gratitude, to almost entering the monastery, to don’t know, to don’t care, to no way. Like everyone, I’ve seen countless “proofs” for the existence of God, like the birth of a grandchild, or the beauty of the bountiful rolling green countryside, and I’ve also seen incontrovertible evidence that God could not possibly exist - like the illness of a grandchild, or grass that has to be cut every week. So when I saw Jennifer Michael Hecht’s tome Doubt I just had to read it. 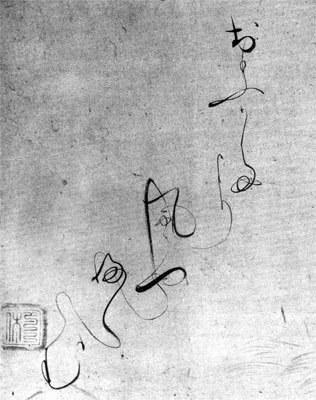 Ah, but as Hecht tells us Shunryu Suzuki said, “No matter what god or doctrine you believe in, if you become attached to it, your belief will be based more or less on a self-centered idea.” Once the self is involved the transcendence is gone. Soon that “religion” becomes, as Dora Black Russell put it, “a sacred fantasy that privilege(s) men.” Heinous acts likely ensue. So, do all religions endanger peace, equality, and truth, as Ramendra Nath claims? I hope not. I hope the endangerment stems not from all religions but rather from the misappropriation of religions, and I hope we can some day recognize the misappropriation for what it is, and not follow the misappropriators into those heinous acts - or condemn whole religions for the actions of those hijackers. As “luck” would have it, coincident with reading Doubt I was also taking an Art History class on the Dutch masters and came across a Terbrugghen painting of Saint Sebastian. Sebastian had just been persecuted for his faith but had not yet been martyred - though I don’t think he was quite capable of doing the Highland Fling at that point. Two women were tending to his wounds, one of the two women attempting to loosen the ties around his wrist. It is the efforts of those two women, not the obstinance of Sebastian, that moves me. “When a wise man points to the moon the imbecile examines the finger.” Confucius nailed it. Summing up nearly 3000 years of history on a subject as vast as 'doubt' is certainly an undertaking (one Hecht just manages to pull off) and at times the books does feel like a mere laundry-list of freethinkers, many of their names I have already forgotten. But other sections (like her attention to freethinking women throughout the ages) more than make up for it. Some sections seem far too brief (almost dumbed down) but I suppose if they weren't this book would be about 3000 pages. My biggest cr Summing up nearly 3000 years of history on a subject as vast as 'doubt' is certainly an undertaking (one Hecht just manages to pull off) and at times the books does feel like a mere laundry-list of freethinkers, many of their names I have already forgotten. But other sections (like her attention to freethinking women throughout the ages) more than make up for it. Some sections seem far too brief (almost dumbed down) but I suppose if they weren't this book would be about 3000 pages. My biggest criticism is that I simply didn't care for her writing style, even the quote I added to my Goodread page seems rather awkwardly worded (but I liked the thought she was expressing enough to add it anyway.) I still gave it a high rating because it was thorough without being monotonous and she certainly introduced me to numerous characters I had never heard of before. This is certainly one of those books that references so many other great books it will cause your to-read list to grow immensely and unlike many similar recent books it avoids being polemical. I have yet to read a book by Ms. Hecht that I didn't find very thought provoking. For an agnostic like myself, this was a enlightening journey through millenia of the history of doubt over religious dogma and theology. It contains more fantasticly memorable and stimulating passages than I'll attempt to repeat here. It was incredibly affirming to read that renowned persons from hundreds or even thousands of years ago were expressing the exact same doubts that have marked my personal philosophical I have yet to read a book by Ms. Hecht that I didn't find very thought provoking. For an agnostic like myself, this was a enlightening journey through millenia of the history of doubt over religious dogma and theology. It contains more fantasticly memorable and stimulating passages than I'll attempt to repeat here. It was incredibly affirming to read that renowned persons from hundreds or even thousands of years ago were expressing the exact same doubts that have marked my personal philosophical journey. Ms. Hecht is an 'equal opportunity' skeptic; quoting doubters of ancient Greek, Christian, and Moslem theologies. You and I are not the first to respond to a religous story or item of theology with the response of, "I strongly doubt that a god worthy of the title would do that." I can't say enough good things about this book. It's long. It's detailed. I loved every minute of it. The subtitle explains it well: "The Great Doubters and Their Legacy of Innovation from Socrates and Jesus to Thomas Jefferson and Emily Dickinson." That's exactly what it does, looking at various philosophers and philosophies, tracing the ideas through the ages, watching how they change. It's fascinating. One thing I loved about it was that it isn't an atheist polemic. It covers some atheists, sur I can't say enough good things about this book. It's long. It's detailed. I loved every minute of it. One thing I loved about it was that it isn't an atheist polemic. It covers some atheists, sure, but also believers with their own forms and levels of doubt. Sure, some religions look pretty bad during some eras. That's because they were pretty bad during those eras. Another thing I loved is that it provides enough background on various religious movements for me to understand the changes in doubt that react to those movements, while not boring me if I happen to already know the details of a particular religion. Well, everyone else has been far more eloquent about this book than I could ever hope to be, but I did want to add a couple of small things. First, I don't remember the last time I read a nonfiction book, particularly a history of any kind, that was so enthusiastic. I mean, there were exuberant exclamation marks in this book. Maybe this is my own fault and I need to do more reading, but those exclamation marks were refreshing. Second, I very much appreciated the awe and the wit. Hecht seems to kno Well, everyone else has been far more eloquent about this book than I could ever hope to be, but I did want to add a couple of small things. Second, I very much appreciated the awe and the wit. Hecht seems to know exactly when to be reverent and when to pull out the clown shoes. Third, it was so comforting to come to the end of the book and find that what I took away from it was exactly what the author wanted. I've been a lonely doubter a lot in my life. Reading this book gave me far more confidence to out myself as an atheist, and made me feel that I'm a part of a fellowship that stretches deep into our history. I bought the book shortly after it was first published. I skimmed it, read the first chapter and set it aside. Time to read it through. I heard the author interviewed on "Speaking of Faith" and was intrigued by her premise for the book. A fascinating look at doubt through ages of human civilization. I recommend it highly to anyone interested in the history of free thought. It took me considerable time to read, taking a small section at a time. It's a book I will read again and use as a reference. Wow! 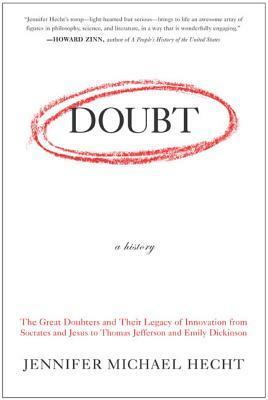 This book is amazing at giving a history of doubt. I have always thought that skepticism and doubt was a big minority in the world (it still is). However, it's the second largest "belief" in the world (the first is Christianity). This book could be used as a text book in class, but it doesn't have that dryness to it that other text books have. I wish that this book was longer so that Hecht could delve into greater detail about doubt into these great thinkers. Jennifer Michael Hecht is a poet, historian, philosopher, and author.